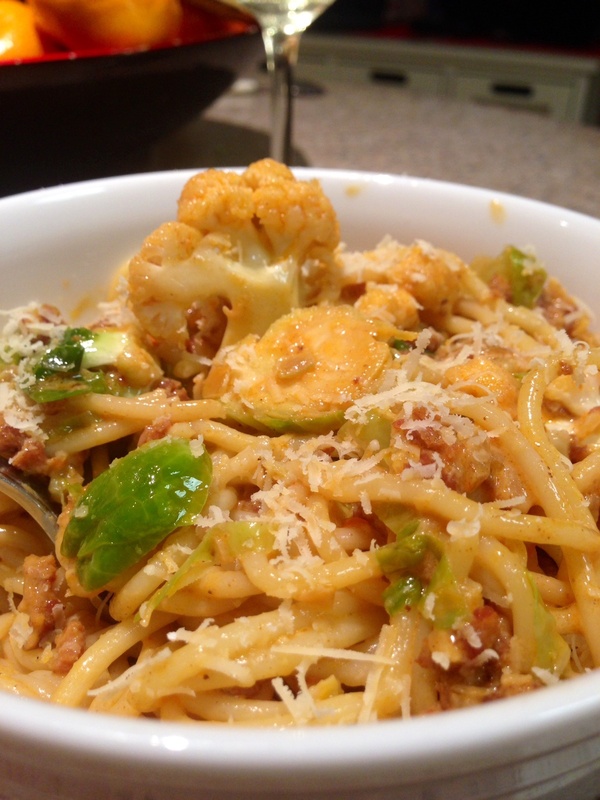 Brussel sprouts, cauliflower and chorizo spaghetti, who would’ve thunk it? SO does most of the grocery shopping. Not because I don’t like doing it, nay, it’s because I like doing it TOO much. He likes to shop at Aldi’s and buy the same ole same ole each and every fortnight. Me, on the other hand, shops at Woolies, the fresh food markets, Asian grocers and deli’s. I live to eat, he eats to live. He spends a little, I spend waaaay too much. Which is why, as we’re on a tight budget, he does most of the grocery shopping. He also has this thing about buying veggies. Lots of veggies, whatever is cheap and abundant. Whereas I meal plan, usually what’s in season, sometimes whatever takes my culinary fancy. Hence, why we always have random vegetables stuck in the bottom of the fridge. They don’t have a home or a recipe, they’re there, because SO feels a need to fill our fridge with vegetables, whether we need them or not. And then it’s left to me to turn them into something edible. Lucky for me, my second most favourite thing to do in this world, apart from laundry, is making up meals out of leftover vegetables and deli meats. Dice the onion, chop the garlic and chilli finely, and fry gently in a pan til translucent. 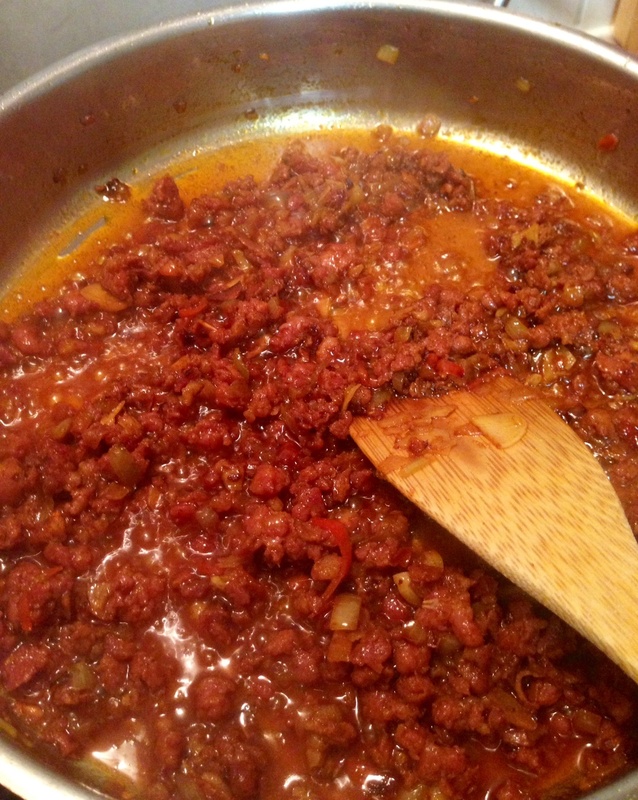 Slice down the middle of the chorizos and scrape the sausage mixture out and into the pan. This is to reduce the chunkiness of the sausage so it melds into the sauce a little better. Add the paprika to the onion and sausage mix and fry until all the fat has reduced and the chorizo is slightly crispy, add some water if its looking a little too crispy. This also gets all the fabulous caramelised bits off the bottom of the pan. 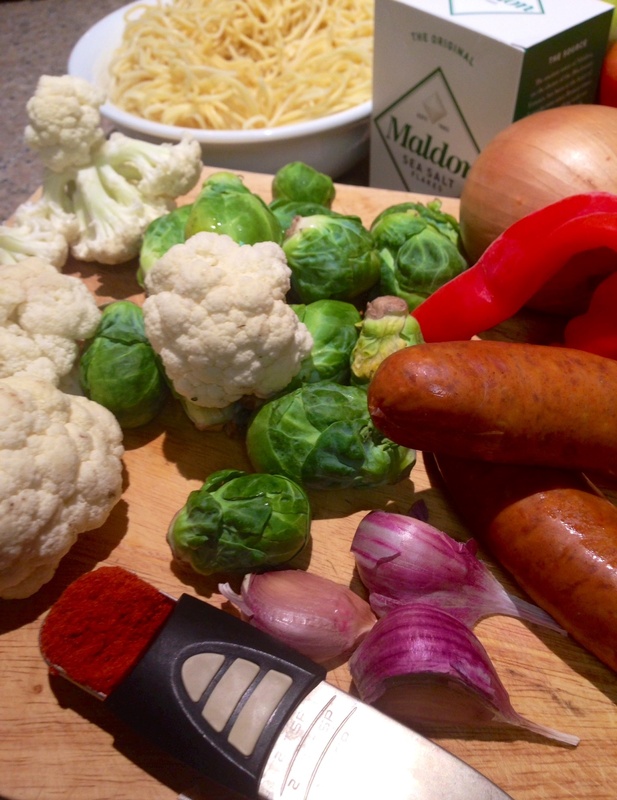 Cut the cauli into small florets and add to the pan, cooking until softened considerably. Slice the brussel sprouts thinly and add to the pan towards the end of the cooking time so they retain their crunch and colour. Add the cream and thin out with a little water so it’s saucy but not too runny. Season well at this stage. 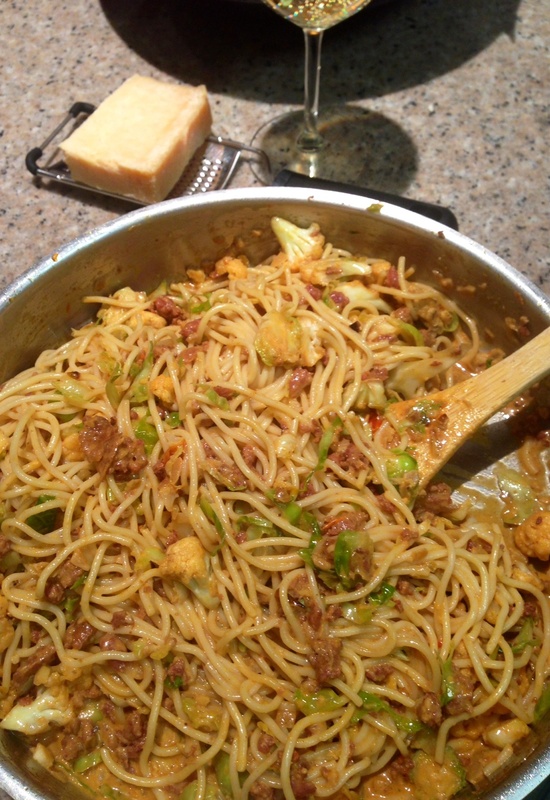 And of course, I had leftover spaghetti in the fridge. 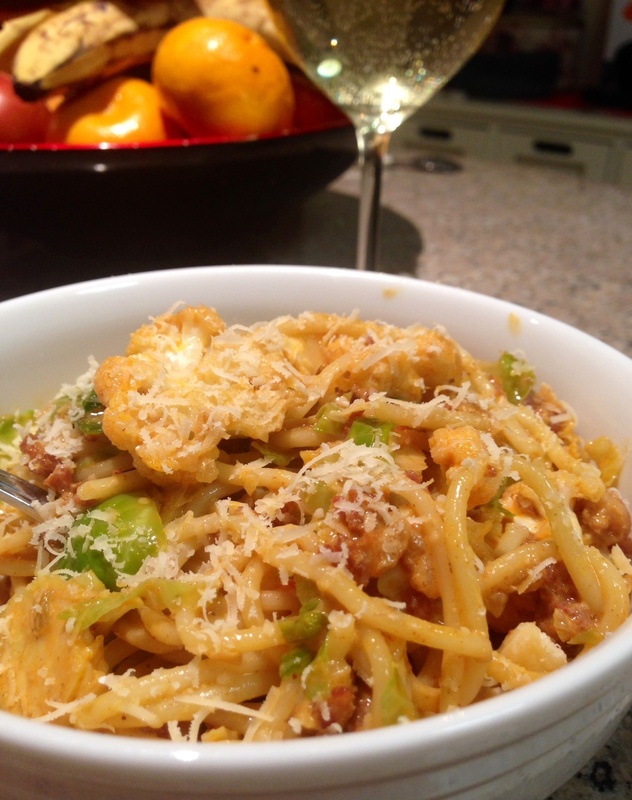 Grate over some Parmesan and eat with a glass of whatever white you have open in the fridge. I had some moscato. Who does the grocery shopping at your place? Do you over purchase veggies, or never have enough? O to the M to the G!!!! That looks very yummy!!! !